"Thank you so much for the fabulous food and your gracious service." "Again many thanks for making our party so wonderful!!" "Thank you to you!!!! Michael and Krestine gave you rave reviews! Thank you so much for all of your suggestions, flexibility and professionalism - It was a pleasure to work with you - I know there will be many more opportunities to work together in the future - and you never know - one day we may meet! "Thank you so much for all that you did for our wedding. I truly felt blessed to have the opportunity to work with you. Thank you so much for coming on as a consultant so late in the game and calming all my worries about space, flow, etc.! You were so calm and wonderful. Thanks also for the amazing food Everyone is still talking about how great it was.... The presentation was spectacular, the food stellar! Thanks ... for contributing to an amazing wedding.... Have a wonderful holiday season. We received nothing but compliments on all food and presentation. Thank you so much for making our day so memorable!" "Another splendid party by 'Mountain Magic...' Thank you so very much for a most special evening. Everyone has commented on the fantastic dinner you prepared. Bert and I could not have been more pleased with the evening. Perhaps next time we should do an opening of the summer party! Thank you for all of your creativity. We truly appreciate your fine work." People were saying it was the best catered food they had ever had. Everyone was raving about the ham and Eric said, 'The ham rocked!' (his words). We both loved it. The fruit was absolutely wonderful and it was all set up beautifully. I heard so many compliments on the food. I could go on and on with them... Thank you for everything!!!" "Thank you so very much for the excellent job you did at our wedding. Since we are both vegetarians we wanted to show people the amazing possibilities and taste without any meat products and very little dairy. Well you certainly came through with flying colors. We heard so many compliments from our guests, and Laura and I want to thank you for being a big part of our wedding day. You certainly did provide magic on the mountain." "Lars and I just wanted to thank you both for helping to make our wedding day so special. Everything was so delicious and fresh, and the presentation was amazing. The wait staff also did a great job, and were very friendly. Everything was perfect, we can't thank you enough for all of your hard work. Lars and I just returned late last week from 3 weeks in Italy. We ate and drank our way through the country. Lots of wonderful food and wine! Thank you ... again, you did a fabulous job. (Those tomatoes you selected were delicious.)" "What a fabulous job for the Kraus-Thomsen wedding reception last weekend! The food was so tastefully selected and prepared and (this is truly amazing in the year 2000) your servers were all so courteous, efficient and just plain NICE YOUNG FOLKS. Thank you for helping to make the occasion so very special." "Thank you so much for doing such an outstanding job in catering our wedding at Tahoe Wilderness Lodge on July 9th. The food was amazing! Everything was so fresh and tasty! The one comment I keep hearing from all our friends is how incredible the food was! We appreciate your work in making our celebration wonderful." " Thank you again for the great party! Everyone loved the event, food and service were great. Also, our function for next year is scheduled for Friday, June 29, 20001, so sign us up! Many thanks again.... I'm your biggest fan...."
" I wanted to thank you both for all of your very hard work in putting together our special menu, food and service for our executive group at Northstar. Everyone raved about Peter's mouthwatering entrees. He is, as you know, a very talented and personable Chef!! Thanks for everything. We are hoping to plan this annual event much further out next time. (Famous last words!) We'll try!" "We just wanted to thank you for the great job you did at Lindsay and Josh's wedding. You were wonderful at listening to their vision and creating an imaginative menu -- and then executing it perfectly! Everyone commented on the food, from the hors d'oeuvres to that chocolate-nut-creation! Your staff was wonderful as well as polite, helpful, and very efficient. There are so many details to worry about for a wedding, but your catering was never a concern. You were both so professional and fun to work with -- THANK YOU, and we look forward to future parties." " Just calling to thank you. Peter was fantastic as were all of your staff. Everything went really well and we all had a great time. I hope we do business again next time we are in the area." "The food was outstanding. Everybody said that it was wonderful, in fact we received compliment after compliment!" 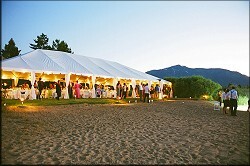 "Thank you very much for your excellent work at our wedding on May 28, at the Tahoe Wilderness Lodge! The food was beautiful and delicious! So many of our friends and family commented on how great it was. We were so pleased with the meals that you prepared! Thank you! Thank you, also, for your excellent coordination services, which really saved the day for us by allowing us to relax and enjoy our day. We were impressed with Mountain Magic, as I wrote, and would be glad to be a reference for you, should future clients wish to speak with someone about your services. Thanks you again for all!" "I am writing you a thank you letter for the outstanding job that Mountain Magic Catering did on David and my wedding reception on May 20th. I would like to personally thank everyone who was working, but can't find my list with their names on it. As I recall, Peter looked like he was running the operation, but there were three other people there -- two servers on one other guy. Could you please e-mail me their names?" " Dave and Holly would like to extend an extra special thank you for being such an important part of their millennium celebrations. Both of your expertise in the kitchen and serving are incredible. Your ability to turn chaos into a memorable occasion is greatly appreciated!" " Just in case you didn't get my message from your website, I wanted to make another request for the Excellent Creme Brulée recipe you served New Year's Eve at Dave and Holly Rippey's. I know you are very busy but if you could e-mail the recipe to me ASAP, I would really, really appreciate it!!! You mentioned that it was the stove top method and I would love to try it! My torch is ready and waiting!! Thanks again! Everything was delicious!"